12 vendors, amongst them Fortinet, have achieved ‘Champion’ status in the latest Canalys Leadership Matrix. 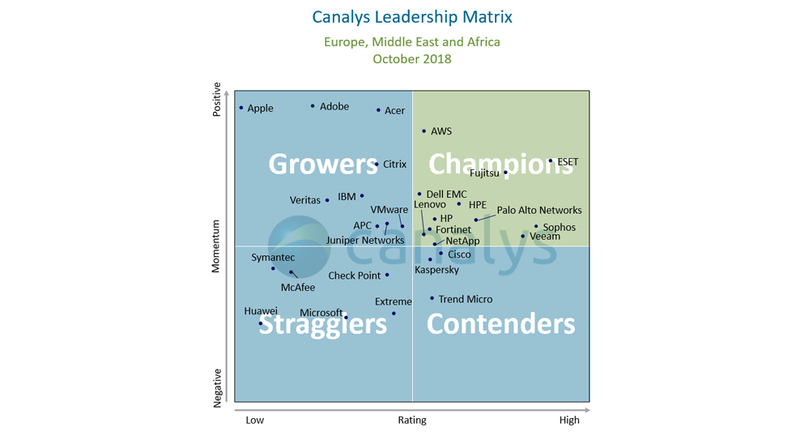 The leadership Matrix combines partner feedback from Canalys’ unique Vendor Benchmark tool with an independent assessment by experienced Canalys analysts of each vendor’s momentum in the channel. This is based on their investments, strategy improvements and execution. Dell EMC, HPE, HP and Lenovo – four of the top sic most important vendors in terms of channel revenue in EMEA – have all contributed to substantial growth for the channel over the last 12 months. Four of the 12 Champions are security vendors, highlighting the opportunity that IT security is creating for partners. The leadership Matrix also recognizes vendors that have been some of the strongest improvements in partner perception over the last 12 months. “Growers” have all benefited from their investments in operational improvements, simpler processes and more attractive financial incentives, as well as stronger commitment to their partners. The Leadership Matrix assessesvendor performance in the channel, based on channel feedback into the vendor Benchmark over the last 12 months and an independent analysis of vendor channel strategy, investment, execution and planned initiatives by experienced Canalys analysts. The Vendor Benchmark tracks leading technology vendors around the world, collating the experiences that channel partners have when working with different vendors. Channel partners are asked to rate their vendors across the 10 most important areas of channel management. Champions: Vendors with High Vendor Benchmark scores, which have shown both continued improvement in channel management, strategy and execution and a commitment to driving future improvements. Contenders: Vendors with High Vendor Benchmark scores, but which have seen declines in channel sentiment and/or a deterioration in channel commitment or execution. Growers: Vendors with low Vendor Benchmark scores, but which have seen improvements in channel sentiment and performance.